Good news for Android enthusiast. The famous cloud storage service, Box has announced free up to 50GB of online storage space and sharing service Box to all Android users. Since last year Box gave iOS users free 50GB upgrade and now it’s finally Android users turn. Box is a cloud-based storage and sharing service for files, photos, videos, documents and other, making the latest versions of each accessible to any device with a web connection. 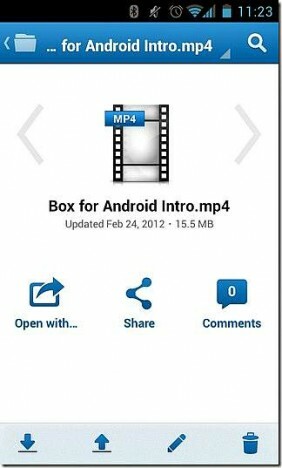 With Box, users can directly upload files to Box from Android’s Gallery using the Share option. In addition, Box also lets users open, share, and leaving or view comments on the files. Besides that, Box also updated to the Android app includes bulk uploading, adding collaborators to a shared folder, App2SD and multi-lingual support, upload files in batch from an SD card, and additional languages. 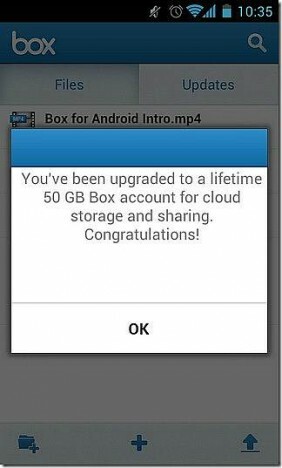 Download Box for Android from Android Market. Log into your account or register for a new one directly from the app. The registration form offers three fields for your email address, password, and password confirmation. Then, click register and log into account. Note: A message will pop up onscreen to confirm that Box account has been upgraded to 50GB of storage and sharing. Start sharing and collaborating in the cloud.